December 16, 2009 - Rentech, Inc. announced that it has signed a Memorandum of Understanding ("MOU") with thirteen domestic and international passenger and cargo carriers that is intended to serve as a framework for a future definitive supply agreement for certified jet fuel from Rentech's proposed synthetic fuels and power facility in Adams County, Mississippi ("Natchez Project"). 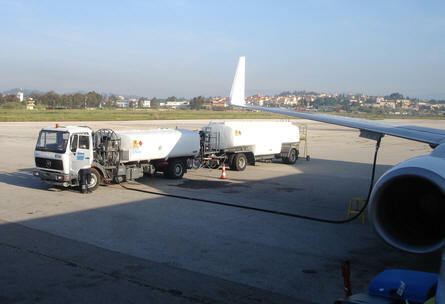 Fuel based on the Fischer-Tropsch process, including Rentech's RenJet(R), is the only alternative jet fuel currently certified for use in commercial aviation at up to a 50/50 blend with traditional jet fuel. RenJet(R) has a lower carbon footprint as well as lower regulated emissions compared to traditional jet fuel. The Natchez Project has the potential to contribute significantly to domestic energy security and economic growth within the state of Mississippi and its surrounding regions. The proposed facility can provide a significant supply of synthetic jet fuel that meets or exceeds existing fuel standards in quality and emissions. A recent economic impact study completed by Alcorn State University concluded that the Natchez Project would create over 2,100 direct jobs and over 3,400 indirect jobs during the project's construction phase. Once operational, the facility is expected to create over 400 high paying direct jobs and over 3,200 indirect jobs according to the study. D. Hunt Ramsbottom, President and Chief Executive Officer of Rentech, said, "This agreement is a significant step forward, representing nearly two years of negotiations between Rentech and our airline partners, establishing a framework for a large group of diverse carriers to negotiate a definitive fuel purchase agreement." Mr. Ramsbottom continued, "We believe that successful relationships with our airline partners, suppliers and the government can advance what is expected to be the nation's first large-scale synthetic fuels facility for environmentally superior alternative sources of domestic energy and significant new jobs that will help our economy grow. Rentech is leading America toward a lower carbon future with the use of domestic technology and resources to fuel our nation's transportation needs." Glenn Tilton, Air Transport Association of America, Inc. ("ATA") Board Chairman and UAL Corporation and United Airlines Chairman, President and Chief Executive Officer, said, "Today's announcement reinforces the proactive steps that airlines are taking to stimulate competition in the aviation fuel supply chain, contribute to the creation of green jobs, and promote energy security through economically viable alternatives that also demonstrate environmental benefits." Mr. Tilton continued, "Our intention as an airline industry is to continue to do our part by supporting the use of alternative fuels. We urge the U.S. government and the investment community also to do their part to further support this critical energy opportunity." Mississippi Governor Haley Barbour, said, "I am very pleased with the progress being made by Rentech in development of the Rentech Strategic Fuels and Chemicals facility in Adams County. It is a long road to developing a project of this magnitude, and Rentech's agreement with the airlines is a strong step forward in the effort to make this groundbreaking project a reality and create good paying careers for many residents of southwest Mississippi." Using Rentech's patented and proprietary synthetic fuels technology based on Fischer-Tropsch chemistry, the Natchez Project as currently contemplated would produce approximately 400 million gallons per year of synthetic fuels and chemicals and over 120 megawatts of clean power from fossil feedstocks, with the possible integration of renewable feedstocks processed with Rentech's biomass gasification technologies. Rentech has contracted to sell all of the carbon dioxide to be captured at this proposed facility to Denbury Onshore, LLC, a wholly owned subsidiary of Denbury Resources Inc. ("Denbury"). Carbon dioxide purchased under the long-term contract would be used for enhanced oil recovery to produce otherwise unrecoverable oil at Denbury's Cranfield oil field in Southwest Mississippi as well as at the company's oil fields within the greater Gulf Coast area. The Cranfield oil field is currently hosting a U.S. Department of Energy ("DOE")-sponsored carbon dioxide sequestration project that is the first in the nation to inject more than 1 million tons of carbon dioxide into an underground rock formation followed by additional injections into the saline portion of the reservoir, more than 10,000 feet below the surface. The sequestration of carbon dioxide captured at the Natchez facility would enable the fuels produced at the facility to have a life-cycle carbon footprint lower than that of petroleum-derived fuels, as concluded in a study conducted by the DOE National Energy Technology Laboratory. Rentech owns an approximately 450-acre property located adjacent to the Mississippi River near Natchez, Mississippi, which is the intended site of this facility. The site has access to multiple feedstocks and product distribution channels including rail, pipeline, barge and roads. Feasibility engineering for the Natchez Project has been completed by WorleyParsons. Rentech, Inc. incorporated in 1981, provides clean energy solutions. The Company's Rentech-SilvaGas biomass gasification process can convert multiple biomass feedstocks into synthesis gas (syngas) for production of renewable fuels and power. Combining the gasification process with Rentech's unique application of proven syngas conditioning and clean-up technology and the patented Rentech Process based on Fischer-Tropsch chemistry, Rentech offers an integrated solution for production of synthetic fuels from biomass. The Rentech Process can also convert syngas from fossil resources into ultra-clean synthetic jet and diesel fuels, specialty waxes and chemicals. Final product upgrading is provided under an alliance with UOP, a Honeywell company. Rentech develops projects and licenses these technologies for application in synthetic fuels and power facilities worldwide. Rentech Energy Midwest Corporation, the Company's wholly-owned subsidiary, manufactures and sells nitrogen fertilizer products including ammonia, urea ammonia nitrate, urea granule, and urea solution in the corn-belt region of the central United States. Founded in 1936, ATA is the nation's oldest and largest airline trade association, representing the nation's leading airlines. Since its inception, it has played a major role in all of the significant government decisions regarding aviation, including the creation of the Civil Aeronautics Board and the Federal Aviation Administration, the creation of the air traffic control system, airline deregulation and, more recently, with the aftermath of the 9/11 attack on America. ATA airline members and their affiliates transport more than 90 percent of all U.S. passenger and cargo traffic. Annually, commercial aviation helps drive $1.1 trillion in U.S. economic activity and more than 10 million U.S. jobs. On a daily basis, U.S. airlines operate nearly 30,000 flights in 77 countries, using more than 6,000 aircraft to carry an average of two million passengers and 50,000 tons of cargo.